For Mother’s Day I decided to get my wife some pyjamas. 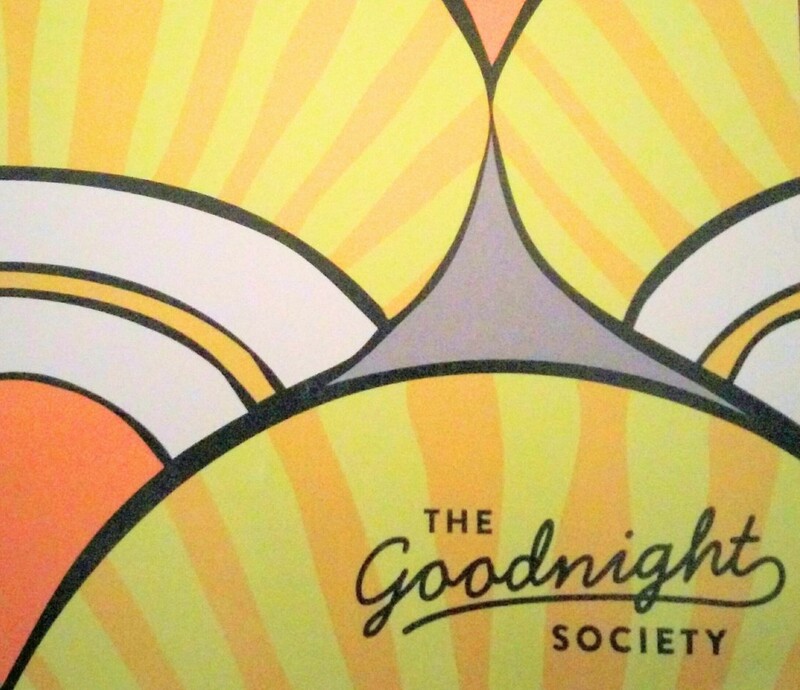 I did my online research, found a company by the name of The Goodnight Society and, with plenty of time to spare before the 10th of May, I bought some sleepwear. Australia Post told me they’d delivered it weeks before Mother’s Day so I got in contact with The Goodnight Society by email. A woman by the name of Kathryn Tyrrell, whom I later found out is the founder of the company, confirmed that they had delivered the clothes to the correct address shortly after I’d ordered them. I’m worried about leaving you in the lurch for Mother’s Day if the parcel has gone missing! Do you want me to get another set in tonight’s express post while we see if the other one can be tracked down? What a lovely offer, I thought. And how entirely unfair that a small business should have to make up for the mistakes of another, much larger organisation. 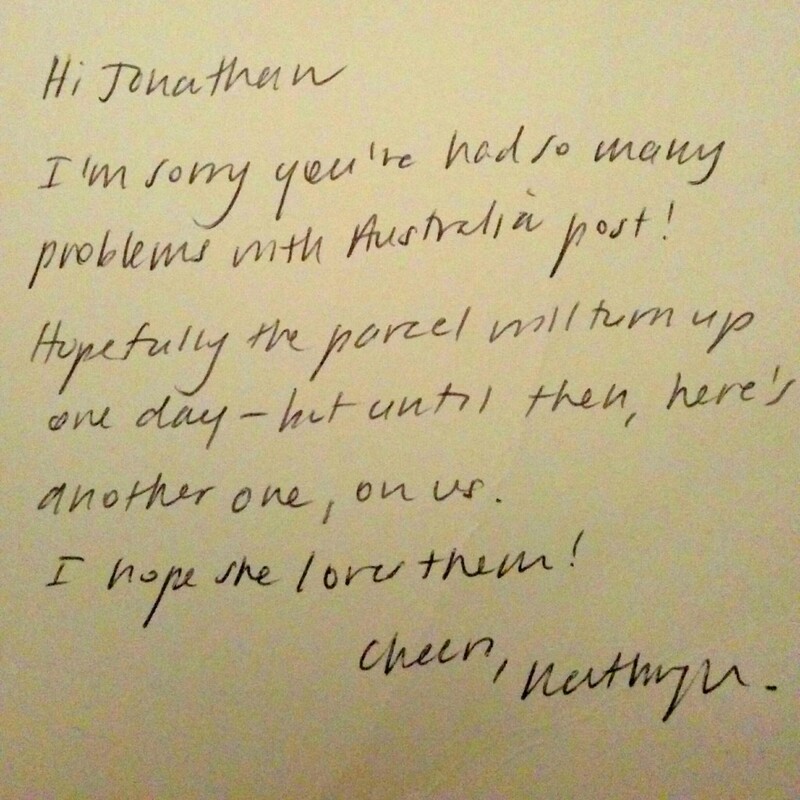 So I thanked Kathryn, declined and pursued Australia Post. I first asked Australia Post what had happened to my delivery in early May. At the time of this post being published I’m still none the wiser. At the end of May I rang Australia Post to check why I still hadn’t heard back from them. They told me their delivery person was certain they’d delivered the items to the right address on the 24th of April. This raised the question of whether someone might have taken the package out of our mailbox (in the case that it was left half-sticking out). This didn’t ring true to me – I guessed that it either would have been far too big or easily small enough to fit into the slot on our locked box, so I contacted Kathryn again to clarify the parcel size. Here’s my email to Kathryn at The Goodnight Society in response. This is an email to convey, without sarcasm, irony or cynicism, my thanks. That probably sounds like a strange way to begin a thank you note, so let me explain. In my spare time, I write emails to people and companies. If that makes me sound like a 32 year old curmudgeon, it’s because I am one. The sole occasion on which I decided to diverge from my hyper-sarcastic/scathingly cruel modus operandi was when I wrote to Weis’ and told them how undies-around-my-head delirious with joy their ice-creams made me. For a long time after Mother’s Day passed I was seriously considering writing an email to Australia Post. It probably would have been an acidic diatribe about outsourcing or a smirking treatise on the virtues of completely ignoring people whose mail goes missing. But then your package arrived and the desire to write something angry evaporated. Your kindness quite literally startled me. In the nicest possible way. I thought about it more and realised my horror was unfounded. For this to be the product of any kind of calculated campaign you would have had to be some kind of manipulator par excellence. You would have had to make sure that Australia Post lost my parcel, then know that I was going to decline your very kind initial offer of an express delivery before Mother’s Day and then know that I was going to contact you again seeking clarification on the size of the package you initially sent as I debated Australia Post’s version of events. I like a good conspiracy theory as much as the next person, but that seems a bit much. So I wasn’t capital-S capital-D Surprised and Delighted. I was just run-of-the-mill surprised and delighted. When the package arrived, I didn’t yell anything obnoxious and I didn’t cry, but I did give a little well-there-you-bloody-go sniff – and that’s pretty good for me. Thank you for quietly intervening to fix up Australia Post’s mess, even after being expressly told that wasn’t necessary. Thank you for making jarmies that aren’t drenched in the sweat of 12 year old workers plying their trade in crumbling Bangladesh buildings. Thank you for doing something thoroughly warm-hearted when today most people are blown away when companies display anything remotely approaching basic decency. Thank you for throwing margins out the window to make a new customer feel loved. Thank you with all the sincerity that a 32 year old curmudgeon can muster. PS: Maybe I just have a proclivity for little Queensland companies who like doing things the right way. Anyway, welcome, Kathryn (for what it’s worth) to a pantheon you share only with Weis’ ice creams. My wife did love the pyjamas.